against self absorption, which emphasizes the importance of correction process. generated via the interaction of pulsed laser with matter. 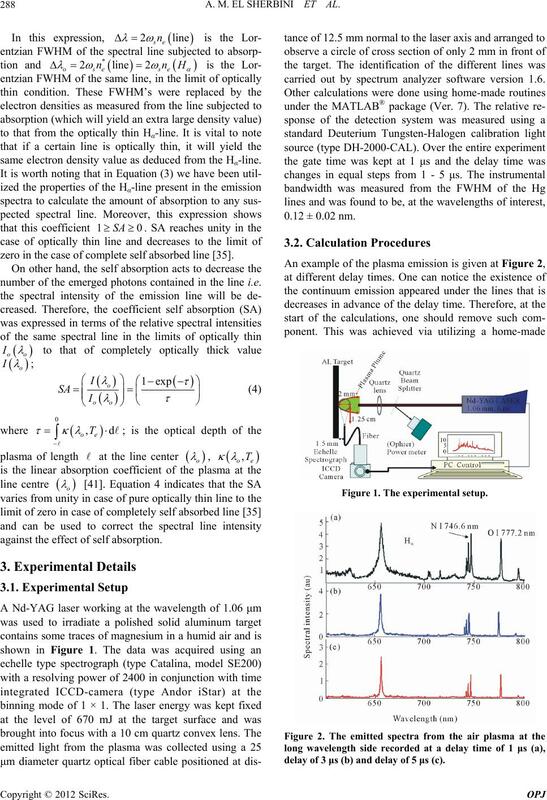 studied using a standard experimental setup. ciently influenced by the plasma parameters. the broadening, to calculate the electron density, [31,32]. density; in the case of neutral atoms is 1016 cm–3. known as multi-elemental Boltzmann plot . that the plasma become optically thick to the line . 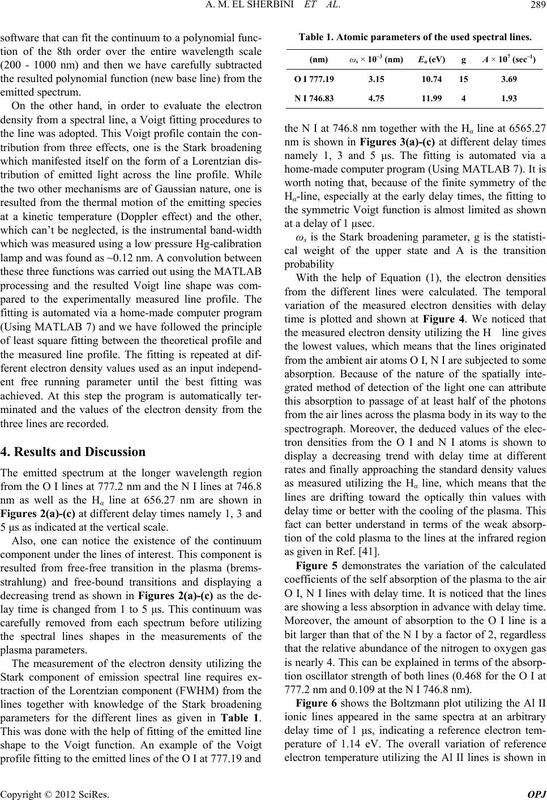 A. M. EL SHERBINI ET AL. same electron density value as deduced from the Hα-line. zero in the case of complete self absorbed line . number of the emerged photons contained in the line i.e. against the effect of self absorption. carried out by spectrum analyzer software version 1.6.
delay of 3 μs (b) and delay of 5 μs (c). 5 μs as indicated at the vertical scale. parameters for the different lines as given in Table 1. Table 1. Atomic parameters of the used spectral lines. at a delay of 1 μsec. as given in Ref. .
are showing a less absorption in advance with delay time. 777.2 nm and 0.109 at the N I 746.8 nm). gles) and from the O I (solid circles). straight line indicated temperature of 1.14 eV. 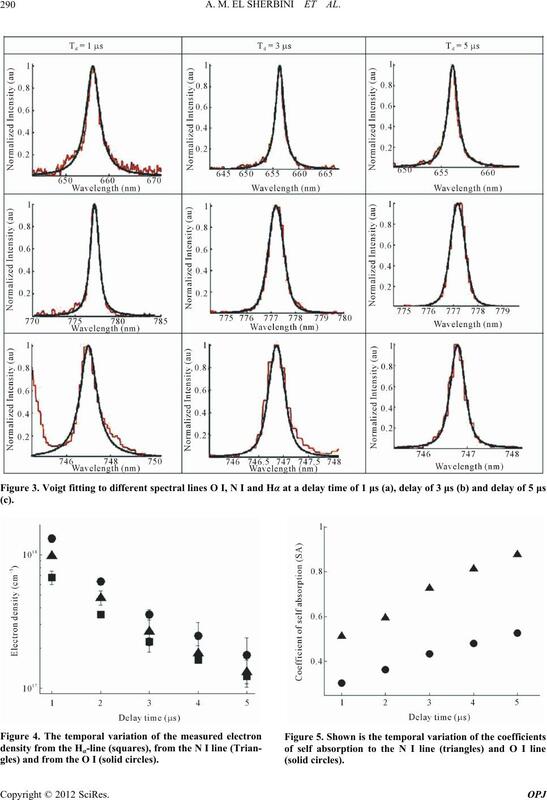 Figure 7 at the different delay times (solid squares). sities emitted by the Al II lines. around the target becomes relatively large . the effect of self absorption (open inverted triangles). 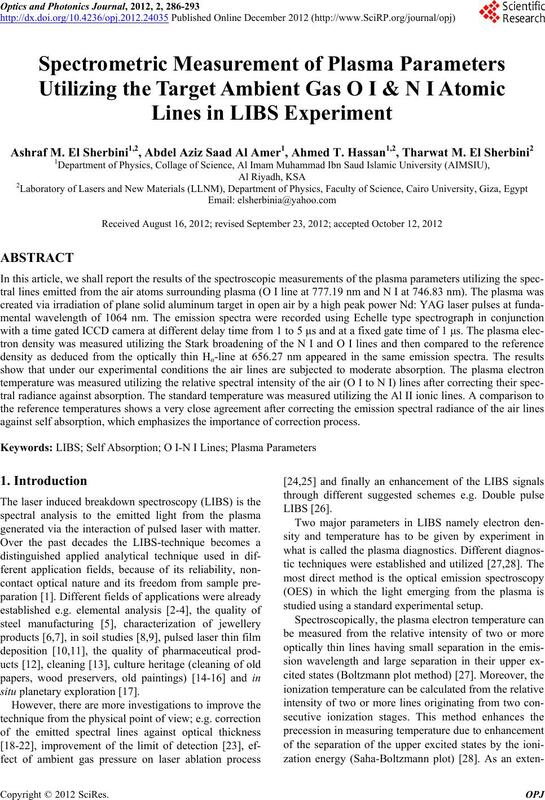 valuable discussions with Prof. S. H. Allam and Dr. H.
Spectroscopy Analysis,” Spectrochimica Acta Part B, Vol. 60, No. 7-8, 2005, pp. 1211-1216. Analysis, Vol. 36, No. 2, 2004, pp. 277-284. Spectrochimica Acta Part B, Vol. 56, No. 6, 2001, pp. B. Le Drogoff, J. Margotb, M. Chakera, M. Sabsabic, O. Part B, Vol. 56, No. 6, 2001, pp. 987-1002.
chimica Acta Part B, Vol. 56, No. 6, 2001, pp. 715-723. Talanta, Vol. 59, No. 2, 2003, pp. 409-415. F. Capitelli, F. Colao, M. R. Provenzano, R. Fantoni, G.
Geoderma, Vol. 106, No. 1-2, 2002, pp. 45-62. Vol. 74, No. 3-4, 2004, pp. 637-642. Acta Part B, Vol. 57 No. 7, 2002, pp. 1131-1140. And Medieval Glass,” Journal of Cultural Heritage, Vol. 1, Suppl. 1, 2000, pp. 287-292. Spectroscopy,” Spectrochimica Acta Part B, Vol. 56, No. Space Science Vol. 52, No. 1-3, 2004, pp. 117-123. D. Bulajic, M. Corsi, G. Cristoforetti, S. Legnaioli, V.
Part B, Vol. 57, No. 7, 2002, pp. 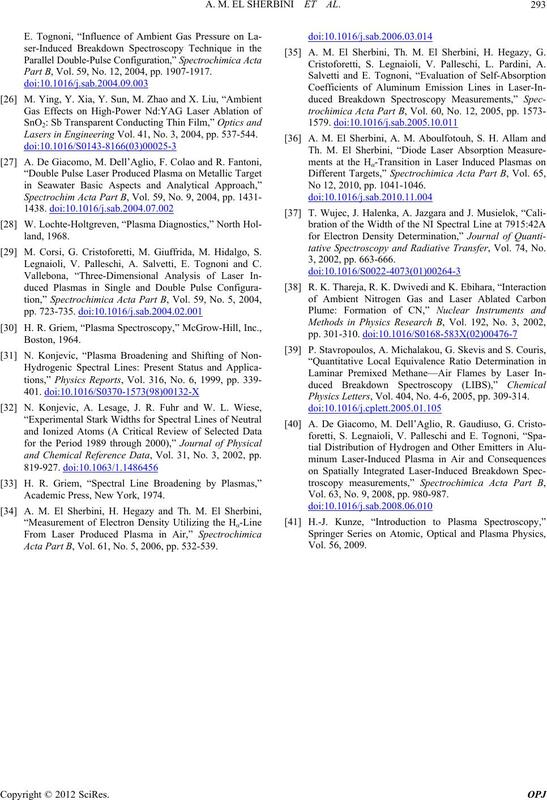 339-353.
ser-Induced Plasmas,” Spectrochimica Acta Part B, Vol. 56, No. 6, 2001, pp. 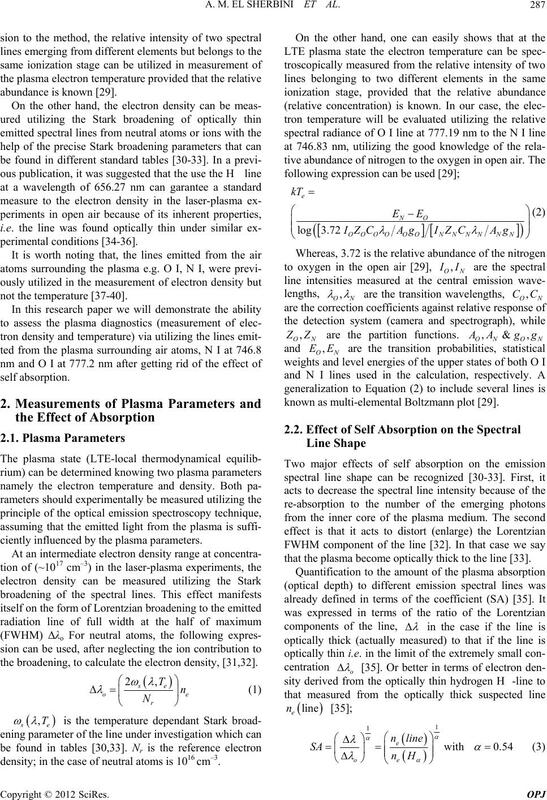 619-628.
troscopy and Radiative Transfer, Vol. 75, No. 6, 2002, pp. Spectrochimica Acta Part B, Vol. 64, No. 1, 2009, pp. Part B, Vol. 59, No. 12, 2004, pp. 1907-1917. Lasers in Engineering Vol. 41, No. 3, 2004, pp. 537-544. 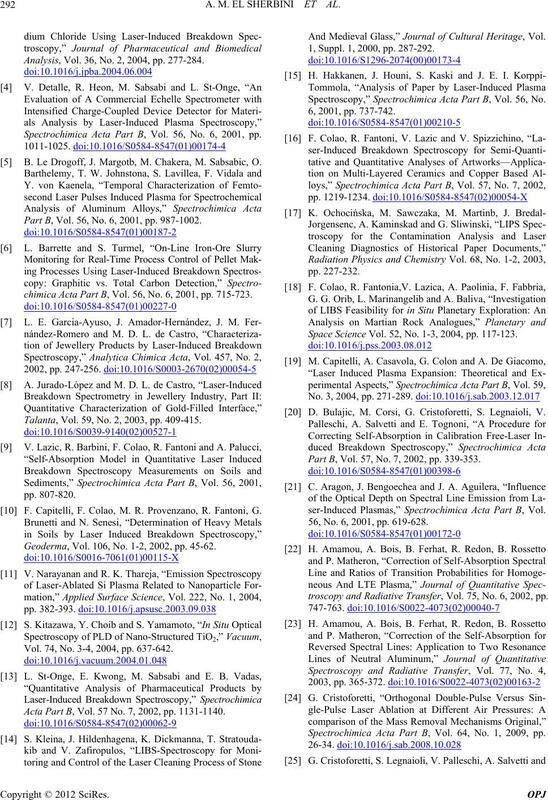 M. Corsi, G. Cristoforetti, M. Giuffrida, M. Hidalgo, S.
Legnaioli, V. Palleschi, A. Salvetti, E. Tognoni and C.
and Chemical Reference Data, Vol. 31, No. 3, 2002, pp. Academic Press, New York, 1974. Acta Part B, Vol. 61, No. 5, 2006, pp. 532-539. A. M. El Sherbini, Th. M. El Sherbini, H. Hegazy, G.
Cristoforetti, S. Legnaioli, V. Palleschi, L. Pardini, A. No 12, 2010, pp. 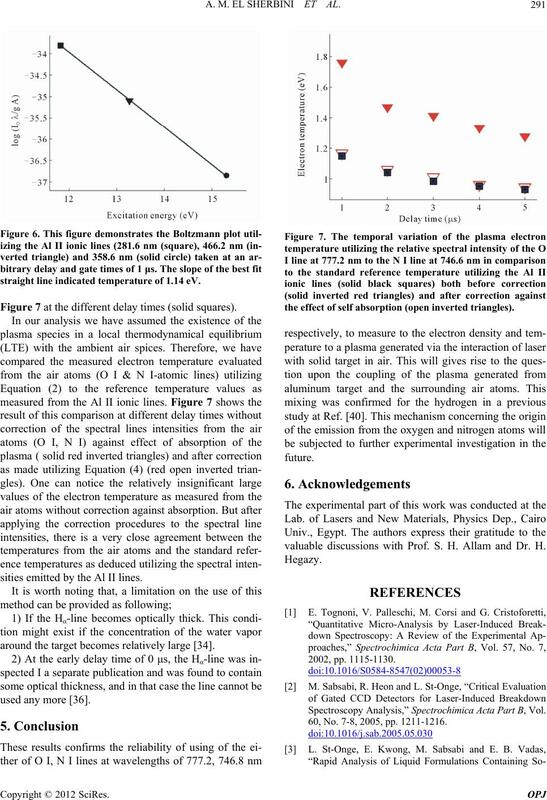 1041-1046.
tative Spectroscopy and Radiative Transfer, Vol. 74, No. Physics Letters, Vol. 404, No. 4-6, 2005, pp. 309-314. Vol. 63, No. 9, 2008, pp. 980-987.